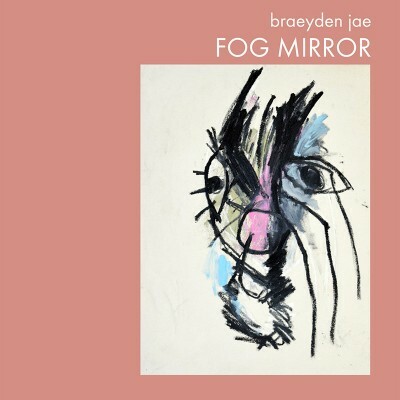 Fog Mirror, by local ambient musician Braeyden Jae (aka Braden McKenna)—released both digitally and on shimmering white vinyl—is an experience for the senses. Attempt, if you will, listening to this album with eyes closed, through a set of headphones, in a dark room, and tell me what glimmering scenes and fantastic thoughts crowd in and through your mind. Without the use of the other senses, your mind will begin to grapple at anything it can. Luckily, Fog Mirror is an album rich in scene and imagination, filled with the cosmic dust from which dreams are made. The cover art above, by local artist Andrew Alba, cues the audience in on this particular and beautifully peculiar world. In a white rectangle stirs a scrawled creature, looking something like a Basquiat rendition of Shakespeare’s Puck from A Midsummer Night’s Dream. With eyebrows thick, chin covered in scraggly hair and a healthy dose of makeup touching its eyes, this creature speaks in equal parts to wonder, fancy and mischief. The white rectangle sits over a warmly serene pink background, giving one an impression of serenity and glamour. “Vanishing Procession” marks the beginning of the album—an ethereal glimmer dances behind a crisp static growl and the occasional crinkling. Much of the album comprises slight variations on these sound types. “Obscured and Waiting” contains a more emotionally attuned sound. Featuring the same shine and static as previous tracks but with the addition of a patiently vamping piano, it ultimately provides the listener with a feeling of contemplation, perhaps on bittersweet detachment. “Two Mirrors Looking” expands upon those bittersweet notions to include, with subtle chugging in the background, a sense of motion and recovery—picking up the salvageable pieces. The final track, “fogged placer,” is a 12-minute departure from the ethereal into a world of saw-driven, industrial action. It is forceful, yet not out of place.